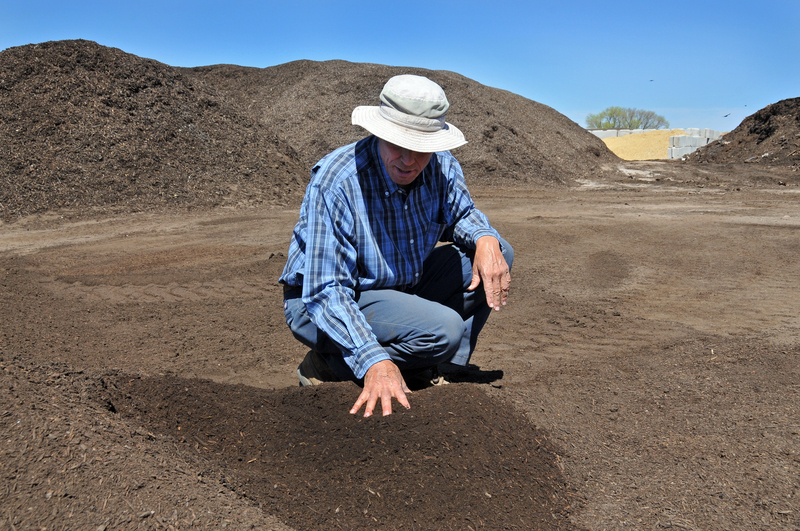 Misch Lehrer, Soilutions manager, examines finished compost at the south valley composting facility. Leftovers from Sandia’s café eventually become organic compost. (Photo by Darrick Hurst) Click on the thumbnail for a high-resolution image. ALBUQUERQUE, N.M. — At Sandia’s largest cafeteria, a leftover burrito will be sent off to eventually help some backyard garden bloom. When someone leaves a bit of lunch behind at Thunderbird Café, employees send it out for composting. The composting program began in March 2010 as a pilot to divert food preparation waste and leftovers from the regular waste stream that is sent to Rio Rancho’s landfill to a local business that recycles food waste into usable (and sell-able) compost. Except for a few initial burps, the program has been a success. “We had problems at first with getting noncompostables separated, but it’s gotten better over time,” café supervisor Steven Lassiter said. The composting program won Sandia’s 2011 Environmental Management Systems (EMS) Excellence Award for the Risk Mitigation/Environmental Protection category. “During the six-month pilot last year, the café diverted more than 15,000 pounds of wet food waste from going into the landfill,” said Sandia/New Mexico’s recycling coordinator Sam McCord. “Thanks to the cafeteria staff’s successful adoption of the composting process and the great results, the program has been fully adopted this year,” McCord said. Sandia soon will divert more than one-third of Thunderbird Café’s routine waste into the composting program, he said. 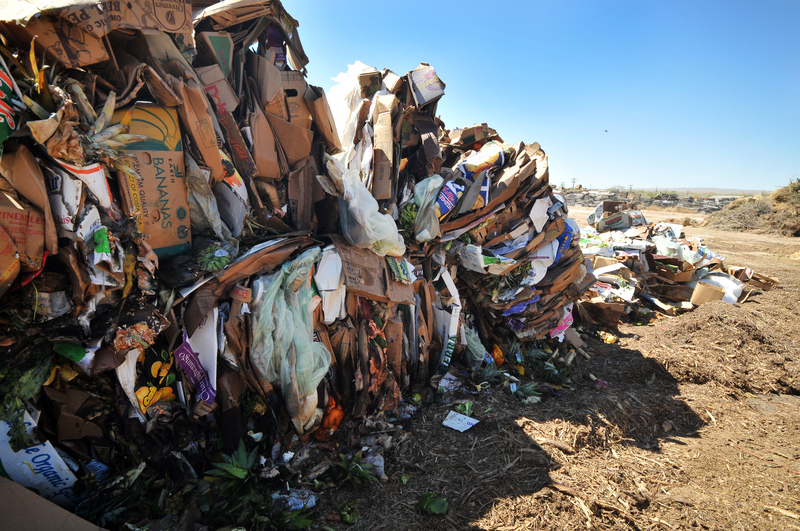 Sandia uses revenue from recycling paper and other waste materials to pay for the composting project. One goal is to reduce the cost of refuse disposal at the cafeteria. McCord also expects the program to expand into other food-service facilities at the Labs, such as the Tech Area 4 cafeteria, where bins are set up for diners to sort their biodegradable materials for composting. Because the Tech Area 4 cafeteria is smaller and requires less variety in its food packaging, it soon will begin using special compostable plates and utensils, McCord said. Over the next year and a half, microbes will convert this garbage to usable topsoil and mulch. (Photo by Darrick Hurst) Click on the thumbnail for a high-resolution image. In the Thunderbird Café’s dishwashing and prep areas, café staff dispose of any plastic items in the regular trash. They then put food scraps and leftovers from dishes into bins lined with bags made from a compostable plant resin. As the bags fill, they are deposited in special green bins outdoors. These bins are slightly smaller than the trash bins used by the City of Albuquerque for residential trash pickup, as food waste tends to be heavier. Even the bins themselves are recycled and still bear “Madison, Wisconsin” logos on them, a leftover from where they began life as residential trash bins. Representatives from food-waste recycler Soilutions pick up the bins twice a week (more if needed). The collected food goes to the Soilutions facility on Albuquerque’s far south side where it begins its metamorphosis. When the bins arrive at Soilutions, all the materials are spread out on absorbent material to remove standing moisture. The materials are then combined in a large pile where workers mix them with drier, ground-up materials such as wood chips and straw. “Soilutions picks up anything that has been alive,” said Misch Lehrer, Soilutions manager. They accept food waste from many area businesses and organizations, such as Whole Foods Market Inc., the Hyatt Regency Tamaya Resort &Spa, the University of New Mexico and Central New Mexico Community College, Lehrer said. Soilutions also accepts manure and straw from area farms, as well as dead and wilted flowers from local flower shops. Additionally, Soilutions harvests scraps from one-time events like the annual Pork ‘N Brew event in Rio Rancho. “We’re basically microbe farmers,” Lehrer said. “We provide ideal microbe conditions. We give microbes food, water and air and they do the work.” Lehrer said the compost’s microbes double in number about every half hour. As they eat, they create carbon dioxide and heat. Wrons said that the program works toward a goal of recycling everything that can be recycled at Sandia. The program helps the Labs procure sustainable products and incorporate sustainable materials management into process and project design practice. Pollution prevention specialists assist the Labs in reducing the use/waste of potable water where alternatives exist. It also encourages Labs’ use of green chemistry principles to significantly reduce chemical purchases and reduce waste generation. Additionally, the group uses days such as Earth Day to educate Sandia employees about sustainable home practices. Sandia National Laboratories is a multiprogram laboratory operated and managed by Sandia Corporation, a wholly owned subsidiary of Lockheed Martin Corporation, for the U.S. Department of Energy’s National Nuclear Security Administration. With main facilities in Albuquerque, N.M., and Livermore, Calif., Sandia has major R&D responsibilities in national security, energy and environmental technologies, and economic competitiveness.